Henry T. Dorrance arrived in Stockton in 1850 and engaged in the saddle and harness business. The Stockton Guard was a millitary unit. Two ounces of silver were used to make this 1952 Stockton Police All Star Game belt buckle. This San Joaquin county deputy sheriff badge was made by San Francisco Jeweler, D. W. Laird and sent to the Glick jewelry company in Stockton. Sterling silver and hand engraved. Circa 1880. D.W.R. (D.W. Reynolds), J.B.P (J.B. Patton). Department photos show C.O. 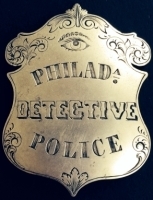 Smith wearing the badge in 1912. Records indicate that F.C. 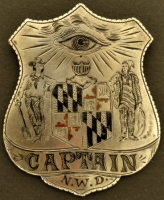 Garlick wore badge 12 in 1890 and then took the job of Police Bailiff in 1891. Ben Franklin Rogers was an old time Stockton, CA Police Chief. 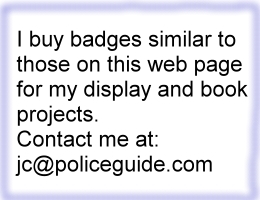 Shown here is his 18k gold badge. Stockton, CA police badge, circa 1920-1928.